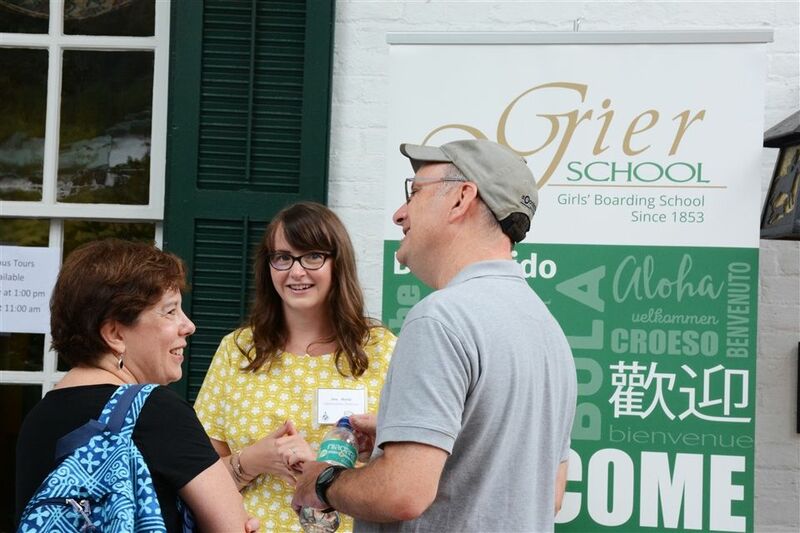 Students and their parents arrived last week to Grier for Opening Weekend, a four-day event leading up to the start of the new school year. 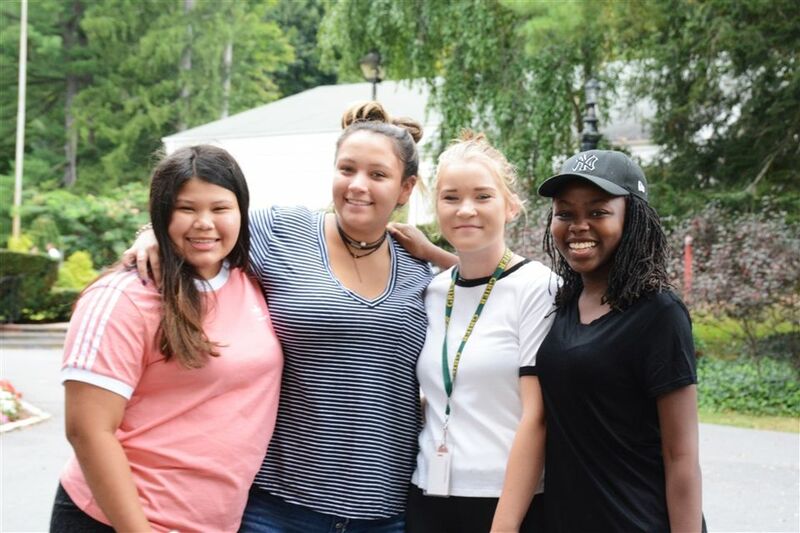 During Opening, Grier welcomed new and returning students and hosted a weekend of fun festivities that included a Carnival on the Colonnade and team-building fun and games with faculty members. Grier was foiunded in 1863, making 2018 its 165th year! 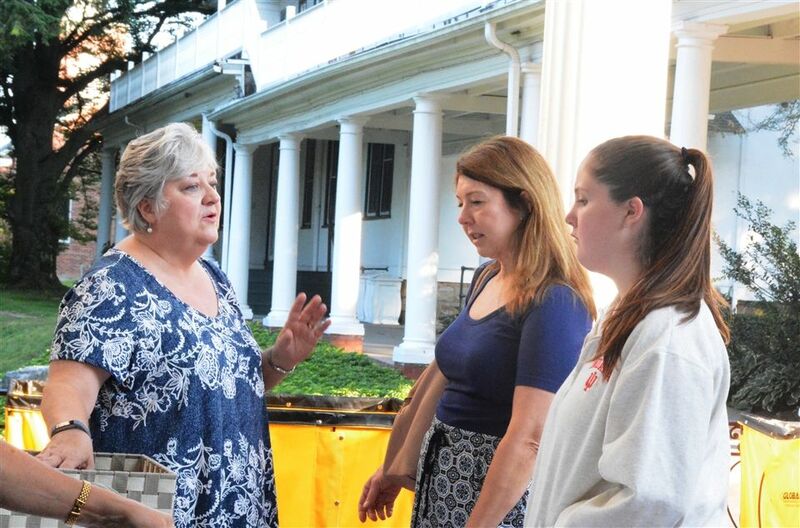 Grier Administrators, Faculty, and Staff prepared for the students' arrival long before the actual Opening Weekend. 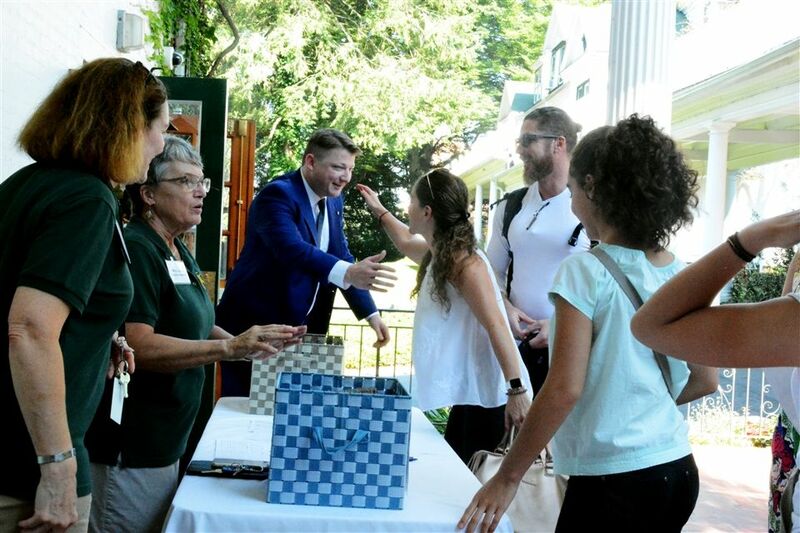 For instance, Transportation Coordinator Deb Myers arranged for students to be picked up at airports, bus stops, and train stations, while other personnel arranged for move-in bins and hired movers. All of Grier's employees received annual training session. 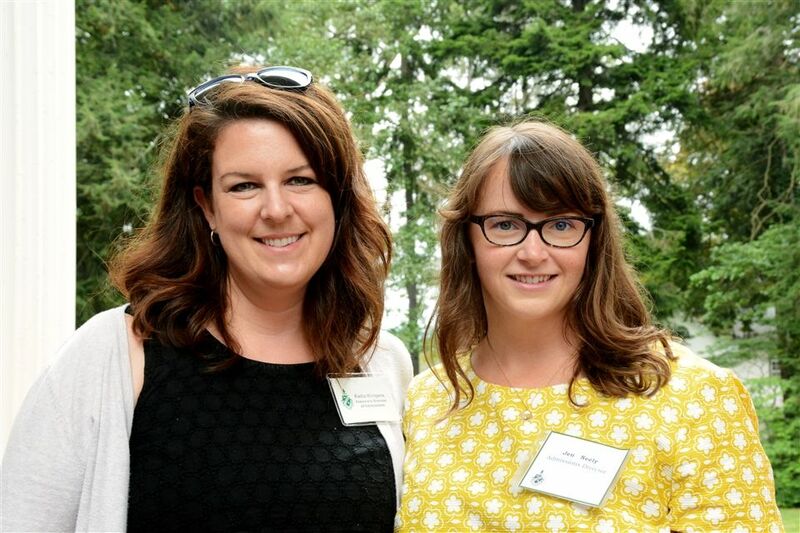 Activities Director Holly Carper was heavily involved in arranging the fun events and trips on Saturday and Sunday. Jim Galloway of our IT Staff prepared students' Grier email accounts and Gretchen Hensor of the Business Office organized textbook ordering. 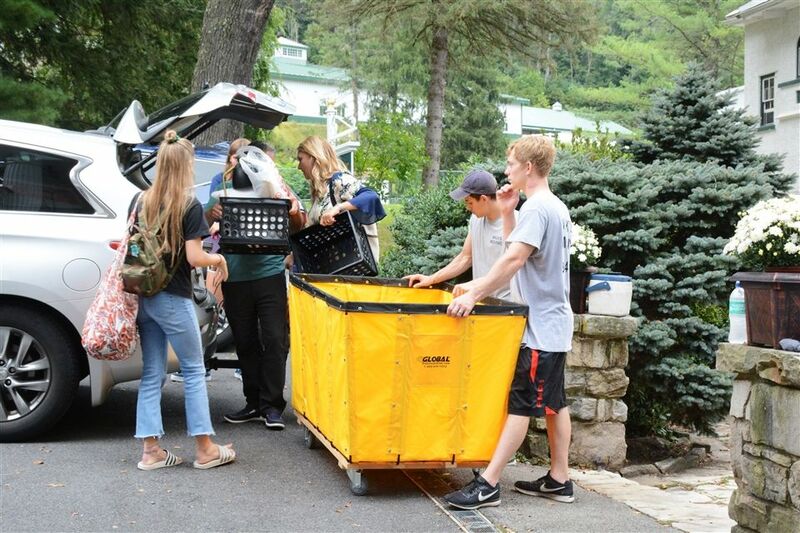 Faculty members directed parents to park their vehicles near the Main Entrance while hired movers unpacked vehicle contents into large yellow bins to deliver items directly to the students' dorm rooms. Then, families parked their vehicles in lots, leaving the Main Entrance clear for other families. 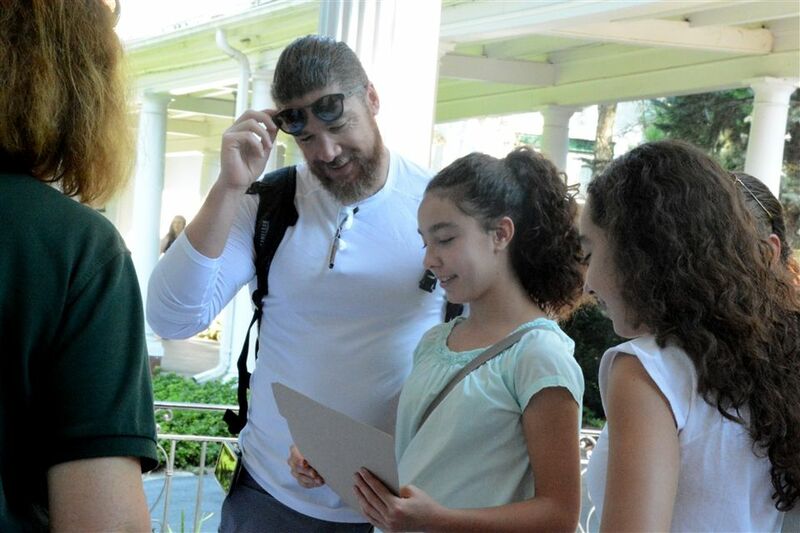 With the assistance of Admissions Directors and faculty members, the system seemed to work like a charm! 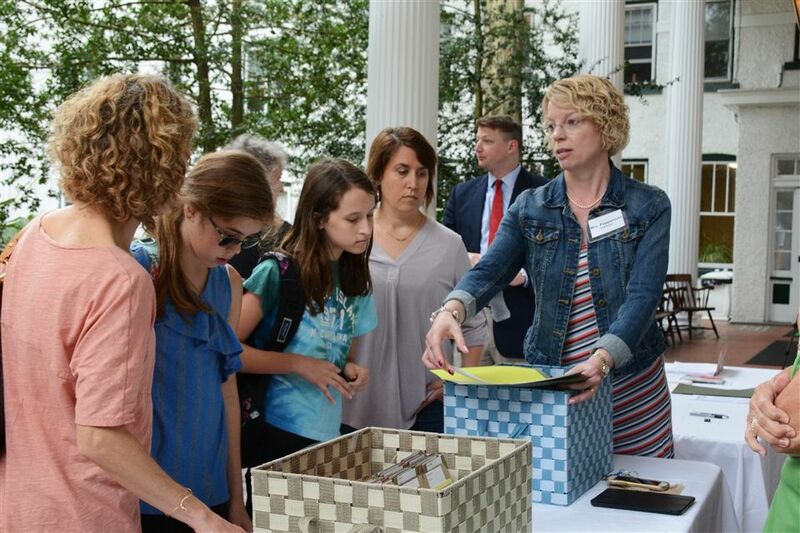 Students visited the registration tables to receive information about their mailboxes, emails, and more. 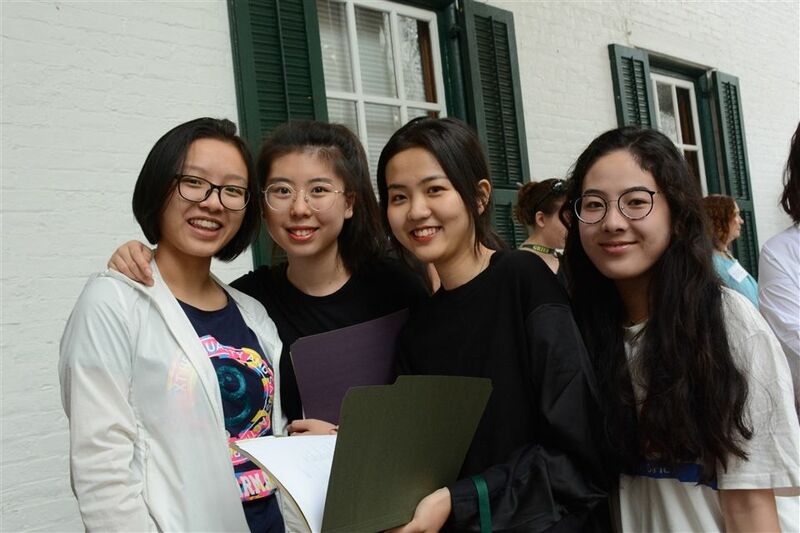 While the vast majority of our students arrived to Grier during the official opening days, several of our English-language learners attended Grier's new International Student Orientation Program, an extended orientation program designed to maximize these students' academic and social success at Grier. Follow us on Facebook and Instagram for more news and photos! 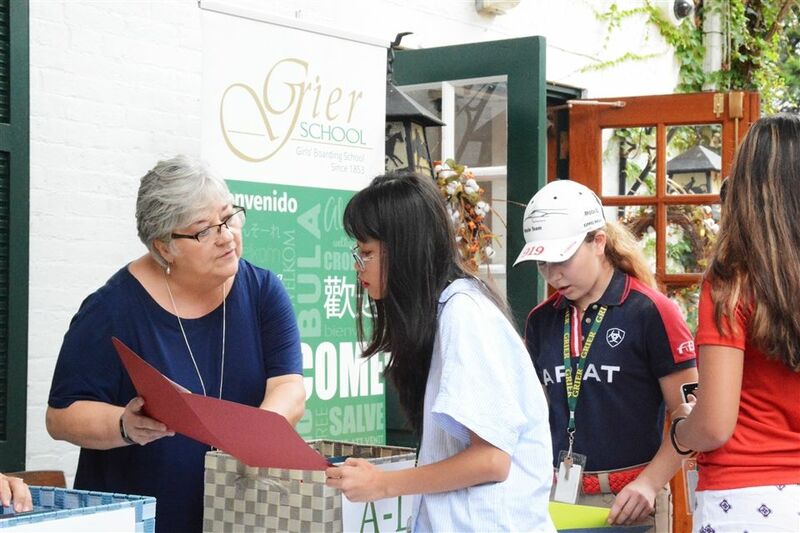 Spanish teacher Ms. Leen greets a new student at the Registration table. Mrs. Pepperman of the Counseling Department explains the information folder to students and parents. 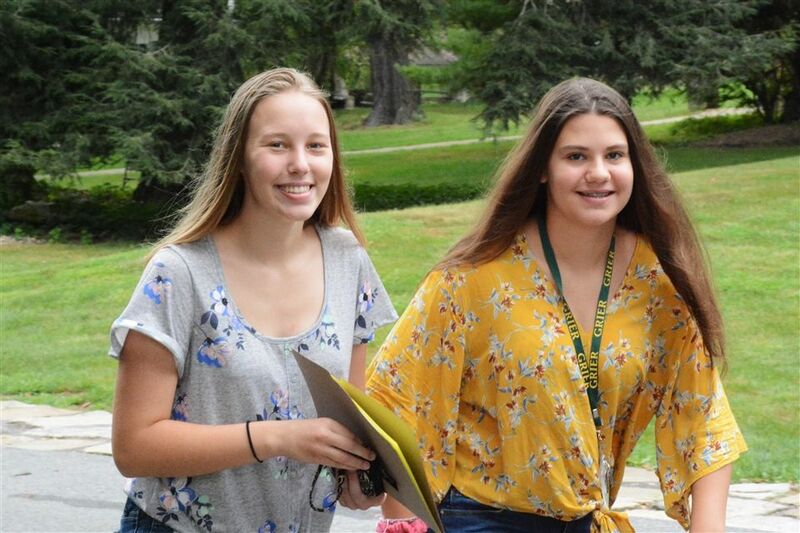 Head of College Counseling Mrs. Price and Testing Coordinator Mrs. Lytle help students locate their registration folders. 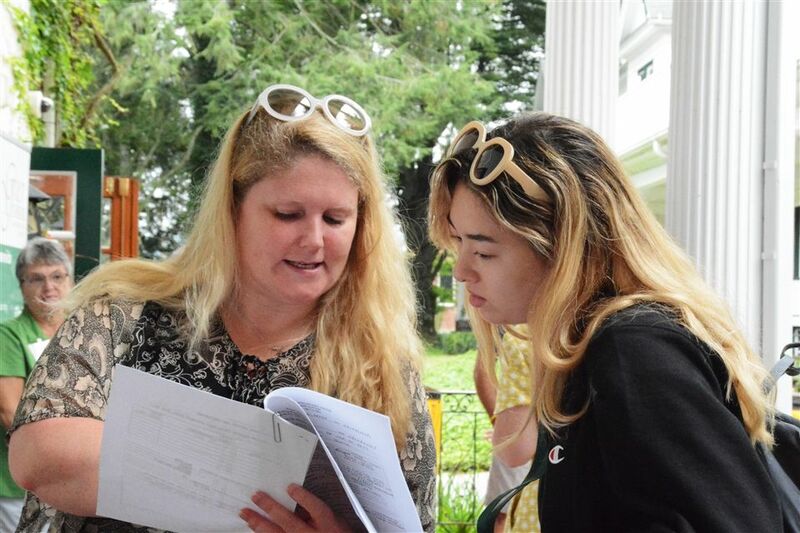 Head of School Mrs. Borst reviews the registration information to a student. Counselor Ms. Crago helps a student find her dorm room. 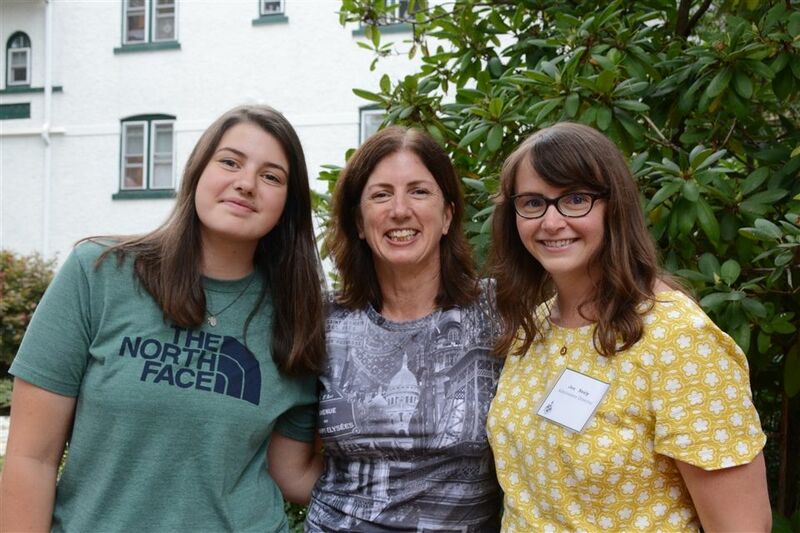 Director of Admissions Mrs. Neely with Sophie and her mother. Associate Director of Admissions Ms. Kingera greeting Leaila and her mom. 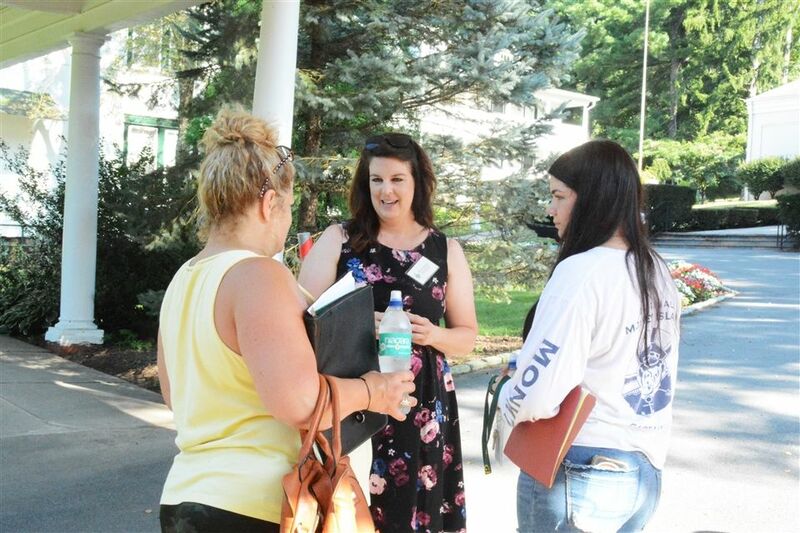 Mrs. Borst greeting students and parents. 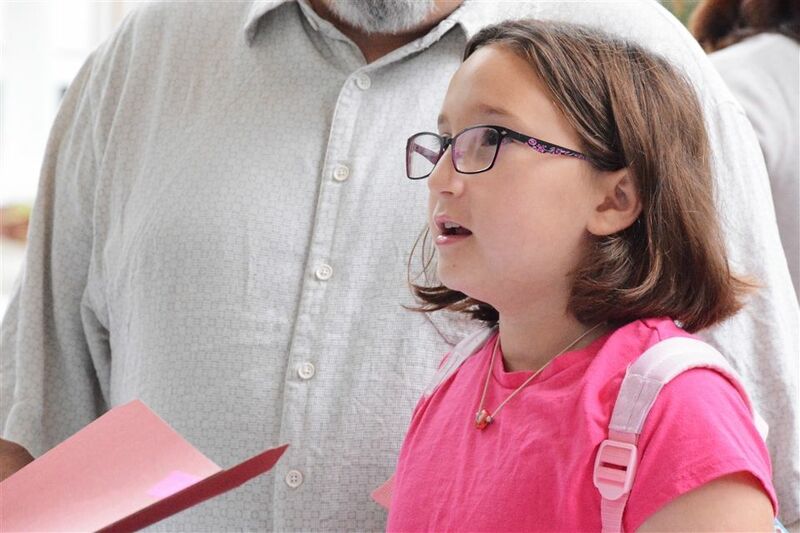 Parents and students could take school tours and parents attended a special meeting just for them. 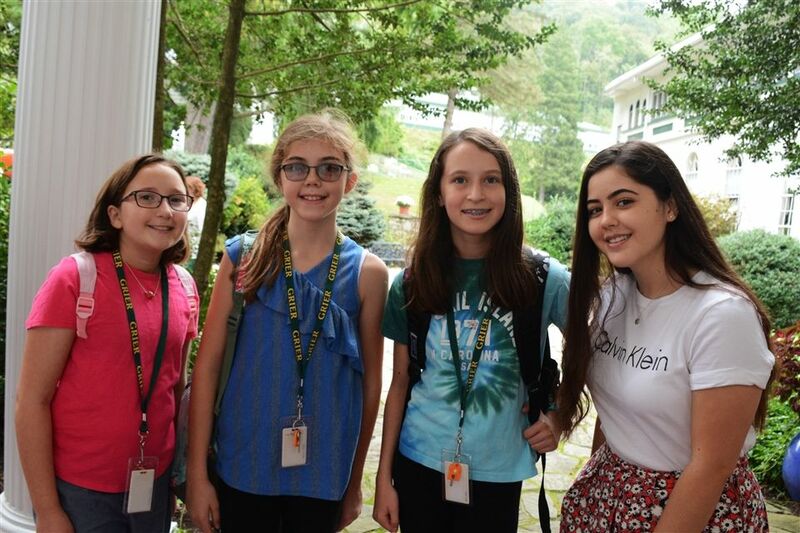 Some returning Grier girls make friends with a new student. Maryanna, Caroline, Nadya, and Zaida. New friends at Grier pose for a group photo. A group of Grier girls getting settled in already. 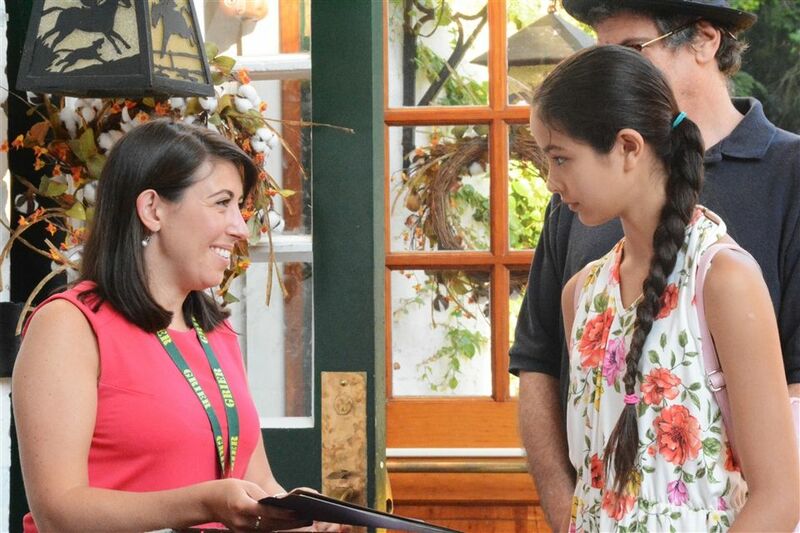 This new Grier girl is picking up her new registration materials. Marcella and Natalia hauling more things up to their dorm rooms. 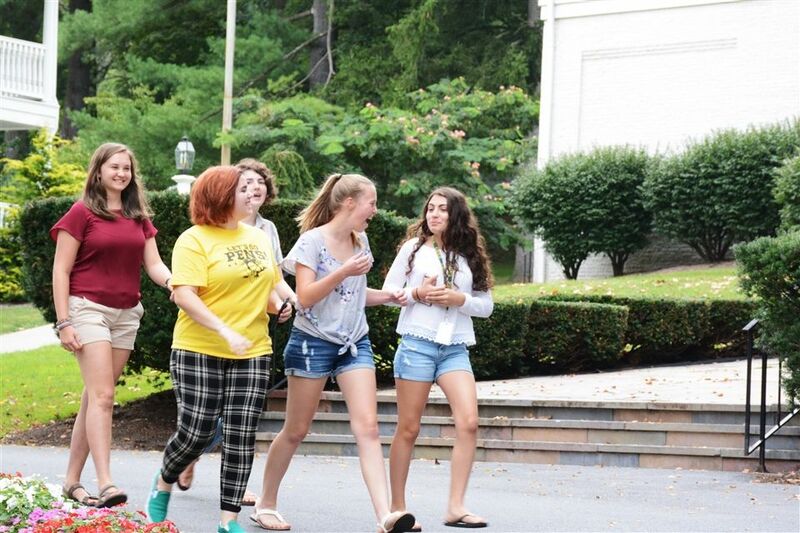 A group of Grier friends on the Colonnade. Director of Admissions Mrs. Neely talking to parents. Associate Director of Admissions Ms. Kingera and Director of Admissions Mrs. Neely. Abby and Lennox walking up the drive to the Colonnade. 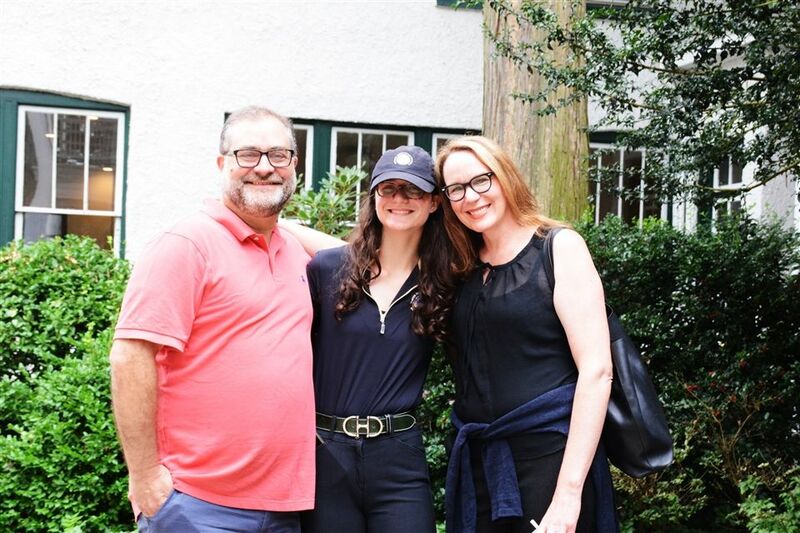 A family poses for a photo in the Courtyard. Parents pull aside to unload their vehicles. Movers help the students move into their dorm rooms. 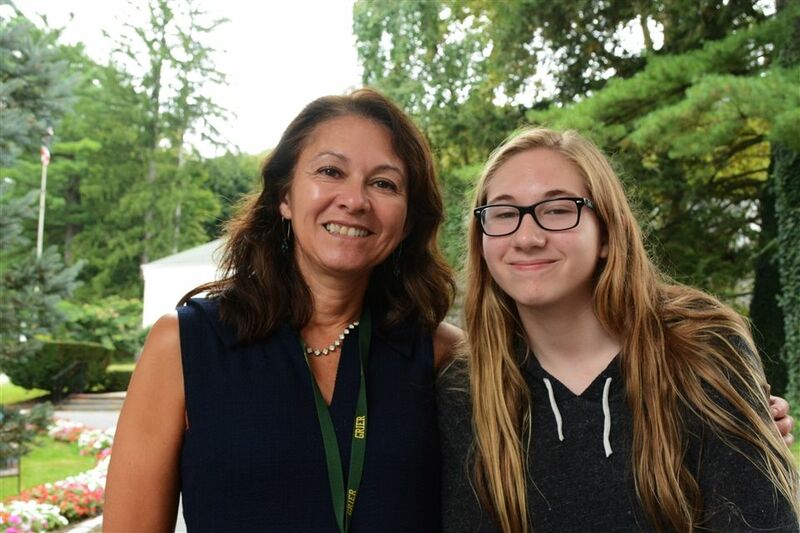 Grier science teacher Dr. Burke and her Grier girl, Molly. 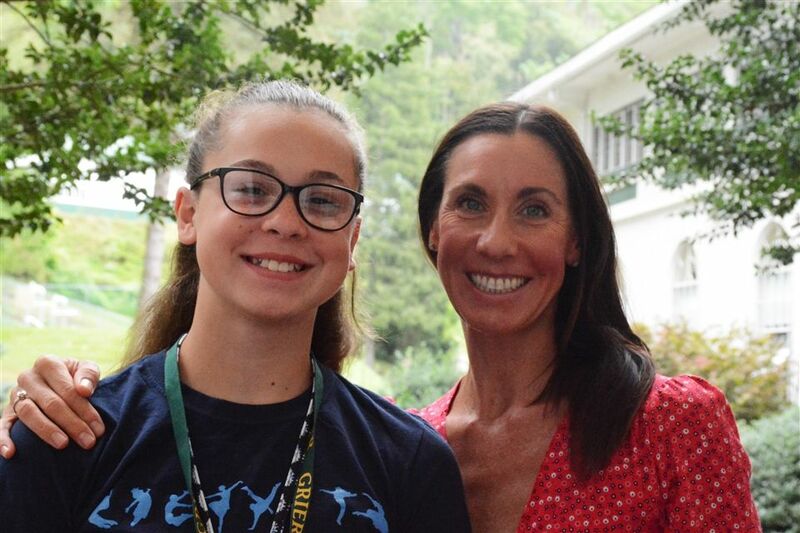 Jillian with her mom, Grier Dance Director Mrs. Joci Hrzic.